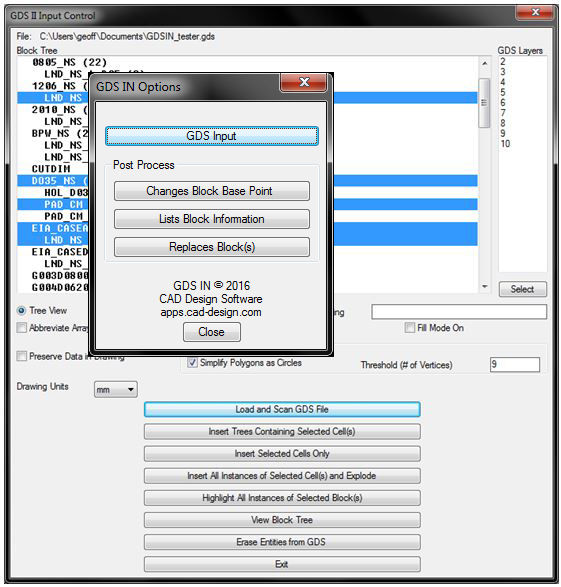 The GDSIN app is a translator that scans and reads in a GDS II stream file into AutoCAD. If the GDS II file contains embedded or nested cells (blocks) these can be individually selected before being imported and drawn as vector objects, while retaining the original layer names. Included are post-processing tools to view and “save to file” the details of a block’s hierarchy from either the Parent or Sub-block levels. Block insertion points can be reset during the import process and selected insertions of a block can be substituted with a new block. TRIAL VERSION NOTICE: This application will allow to VIEW-ONLY the read GDS File in a slide window. Only purchase will allow reading into AutoCAD as vector objects. *CAD Design Software owns a Paypal Merchant account to allow use of a credit or debit card for a one-time purchase without need to create or use a Paypal account.